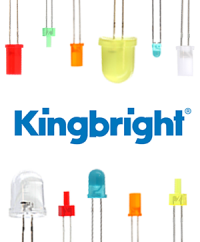 Optoelectronic components play an important role in many electronic devices. They are used for displaying information or signalling and controlling of circuits. Our shop offers various components in the category optoelectronics. 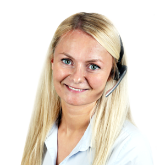 The range of optoelectronics products covers everything from diodes, indicator lights, displays and display accessories to LED sockets and opto components. 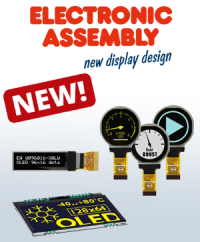 Displays are available in various sizes and colours as graphics or text displays. 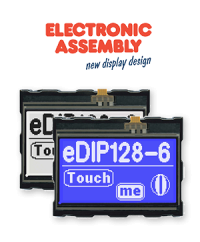 Touch displays may be ordered as well. In the sub category opto components we offer opto couplers, opto triacs, photoelectric barriers and photoconductive cells. Sockets for our LEDs are available in metal and plastic. Some sockets feature inner and or outer reflectors. 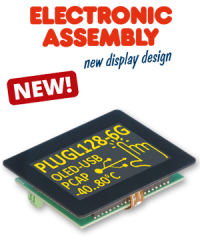 For displays we offer accessories such as adapter boards, female headers, mounting bezels, front frames, LED lighting and other products. 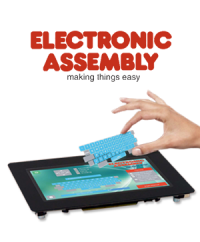 Our purchasing colleague Christin Wichmann visited the Electronic Assembly stand at electronica in Munich today. 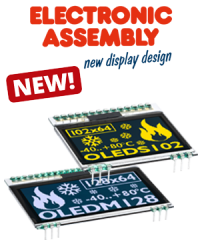 As from now you will find the new graphic OLED displays from Electronic Assembly in our online shop. 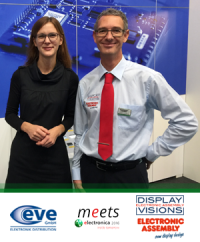 Marcus Peters, head of purchasing, and purchaser Christin Hagel from the EVE GmbH visited Electronic Assembly at the electronica in Munich. 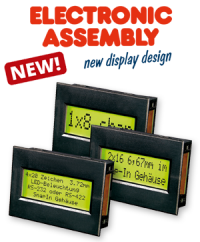 The company presented the new EA uniTFT050 displays, which are included directly into the product range of EVE. “A picture is worth a thousand words”. To an increasing extent, development teams are taking this truism on board. They are designing in graphic displays rather than alphanumeric panels to show machine state information and instrumentation data.